For those of you who haven’t seen the story on Susan’s blog already, we had quite a fun adventure a few days before Christmas. 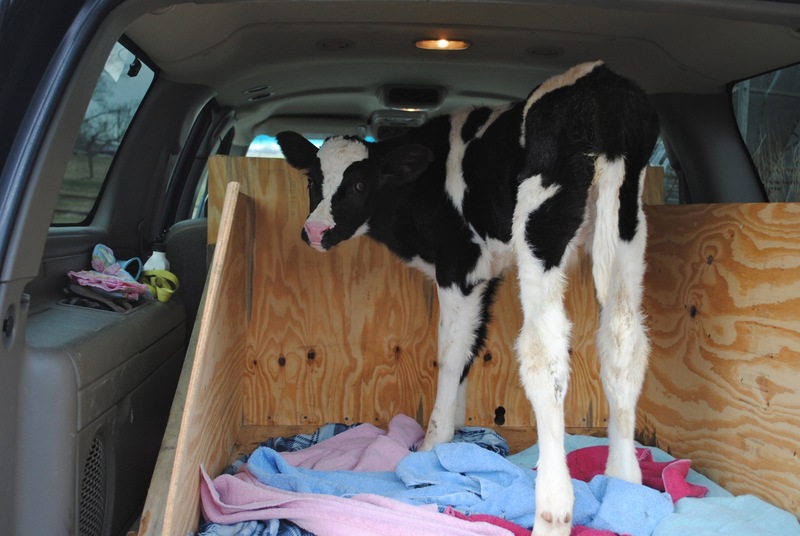 Susan called me one evening and I asked if I would like to help her pick up some baby cows. An hour and a half away. In my truck. The thing about this kind of this is that YES. Yes this is the kind of thing I would say YES to. Also, Susan and I haven’t been on a road trip together in ages, and this mini trip promised the kinds of fun we could talk about well into the future. So we loaded up our “Ram Cram” box into the back of the suburban and headed out after a quick run through the Dunkin’ Donuts drive-thru for large iced coffees all around. Did I mention Zac came with us? I think he was picturing a fun and relaxing road trip. I think Susan and I were thinking it would be fun to have along someone else to do all the hard work. Fortunately we had great weather and the drive was easy. 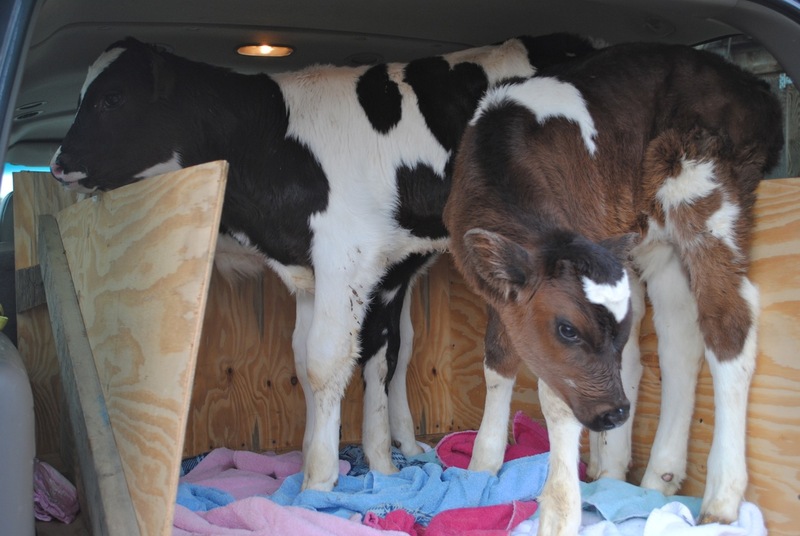 Before we knew it, we were there, staring down the reality of cramming 3 calves into the truck. One cow in place. At about 2 and a half weeks old, these guys are just under 100 lbs each. In a year’s time they’ll each top out around 1,000 lbs or so. Cow number 2 in place. These two are called “Madison” and “Monroe”. And cow number 3! This cute little brown guy is called “Jefferson”. With some trepidation I closed the hatch and we started our drive back to Juniper Moon Farm. 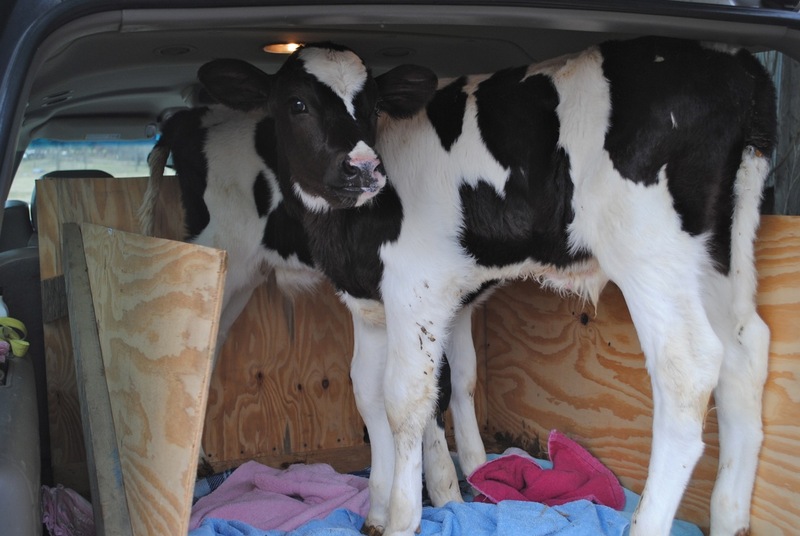 They were a bit anxious and had trouble adjusting to the movement at first, but after a bit they settled down (and thought the lights and hooks in the ceiling were teats). 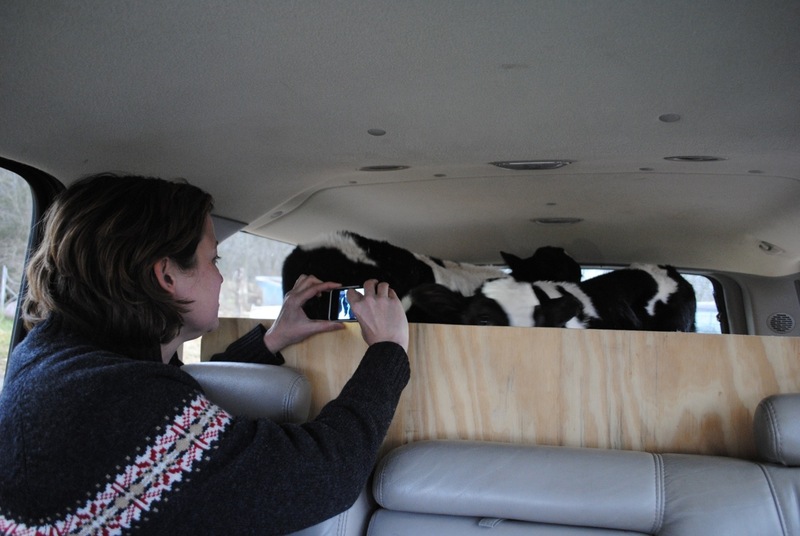 Susan got to hang out in back and get lots of cow kisses. These little boys are very friendly. We felt quite smug cruising down the highway with our haul. 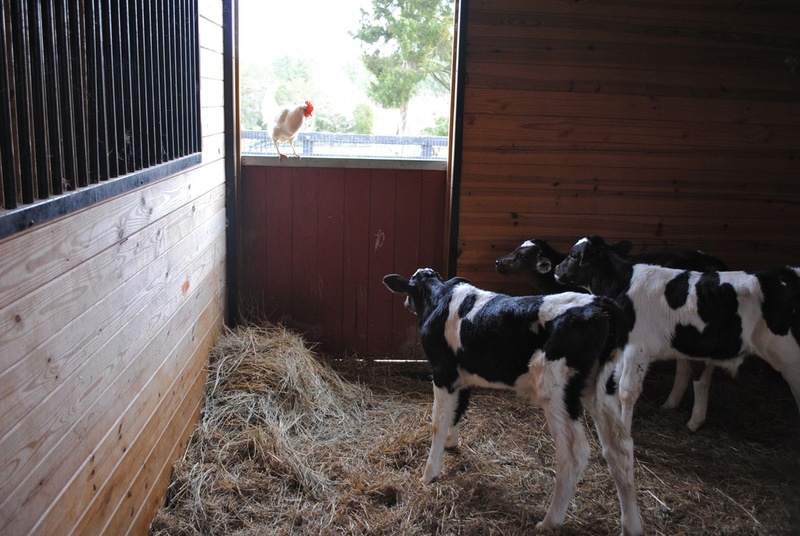 Caroline was thrilled to come out and help us get them all situated in the barn and nuzzle their sweet faces. Once they’re full grown it’ll be hard to believe we ever managed this, but we certainly won’t forget how much fun it was. I can’t wait to see what she’ll ask me to put in my truck next!